Workman Publishing Company, 9780761149477, 242pp. 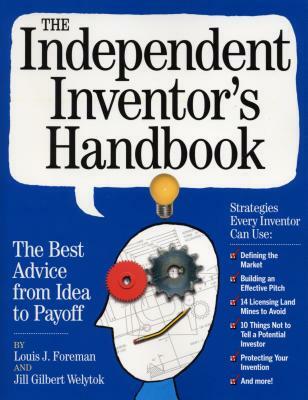 Written by Louis J. Foreman, creator of the PBS series Everyday Edisons and a holder of multiple patents, together with patent attorney Jill Gilbert Welytok, here's a book that speaks directly to the inventive American—the entrepreneur, the tinkerer, the dreamer, the basement scientist, the stay-at-home mom who figures out how to do it better. (over one million of them file patents each year.) Here is everything a future inventor needs: Understanding the difference between a good idea and a marketable idea. Why investing too much money at the outset can sink you. The downside of design patents, and how best to file an application for a utility patent. Surveys, online test runs, and other strategies for market research on a tight budget. Plus the effective pitch (hint: never say your target audience is "everyone"), questions to ask a prospective manufacturer, 14 licensing land mines to avoid, "looks-like" versus "works-like" prototypes, Ten Things Not to Tell a Venture Capitalist, and how to protect your invention once it's on the market. Appendices include a glossary of legal, manufacturing, and marketing terms, a sample nondisclosure agreement, and a patent application, deconstructed. Louis J. Foreman is a serial entrepreneur with a passion for innovation. He started his first business from his college fraternity room and for the past 20 years has been starting and building successful companies. Louis is the founder and CEO of Enventys, a product-development firm working with major consumer product manufacturers and leading retailers. He is the publisher of Inventors Digest magazine and executive producer of the Emmy ® award winning PBS show Everyday Edisons. He lives in Charlotte, North Carolina. Jill Gilbert Welytok is a registered patent attorney and a founding partner of Absolute Technology Law Group LLC, specialists in helping independent inventors reach their entrepreneurial goals. She has written several books on legal, business, and technology topics, and lives in Milwaukee, Wisconsin.